You don’t have to wait for Sunday Funday to get some of the coolest brunch food in town. At The Biscuit Bar in Granite Park, brunch is served on a daily basis. Offering an incredible selection of biscuit based sandwiches and toasts, The Biscuit Bar gives a whole new meaning to southern hospitality. On the outside of The Biscuit Bar is a large window, where guests standing in the often long line can see bakers kneading dough and baking biscuits by hand. Inside, there is a full bar, where guests can order juices, beers and kombucha on tap, as well as signature cocktails. The dining room is bedecked with modern furniture, painted with a simple, minimalistic color scheme. 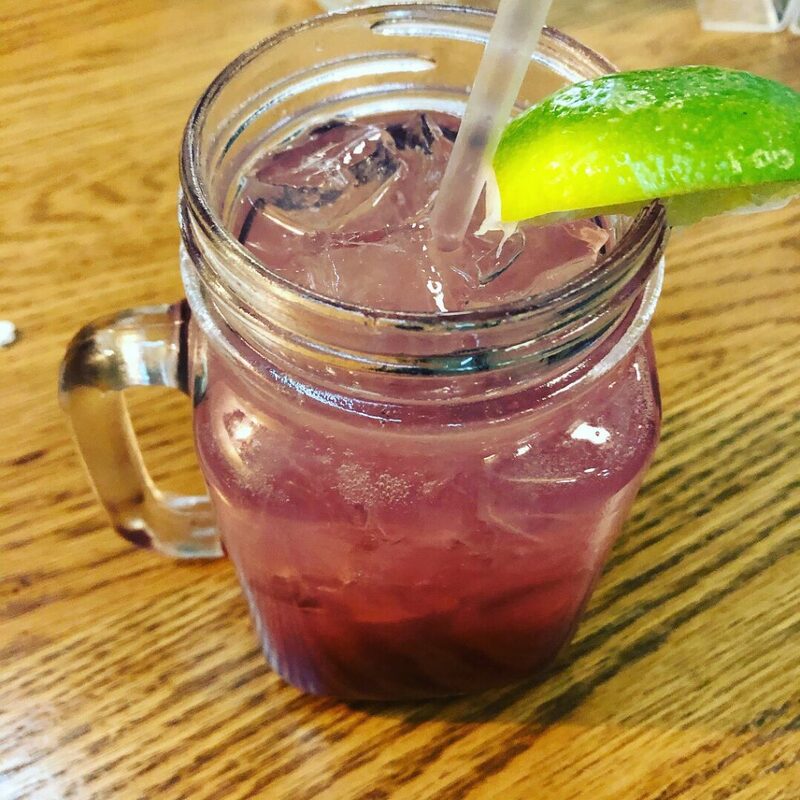 One of The Biscuit Bar’s signature cocktails is the Blackberry Tequila Smash, which consists of Reposado Tequila, blackberry liqueur, triple sec and lime. The Smash is somewhat heavy on booze flavor but comes together with the fruit to make a lush, juicy blend. A good, non-alcoholic option is the Buddha’s Brew peach kombucha, which is served on tap. For those not familiar with kombucha, it is a fermented, carbonated black tea beverage loaded with probiotics. It has a taste and texture similar to soda. Sweet brunch options include The Biscuit French Toast. It is prepared the exact same way as traditional French toast, however, the sponginess of the biscuits absorb more sweet, sugary flavor. Equally as good is the savory Fancy Chicken Biscuit, which is a piece of fried chicken, slathered in The Biscuit Bar’s signature secret sauce, topped with salty dill pickles and sandwiched between two soft, flaky biscuits. 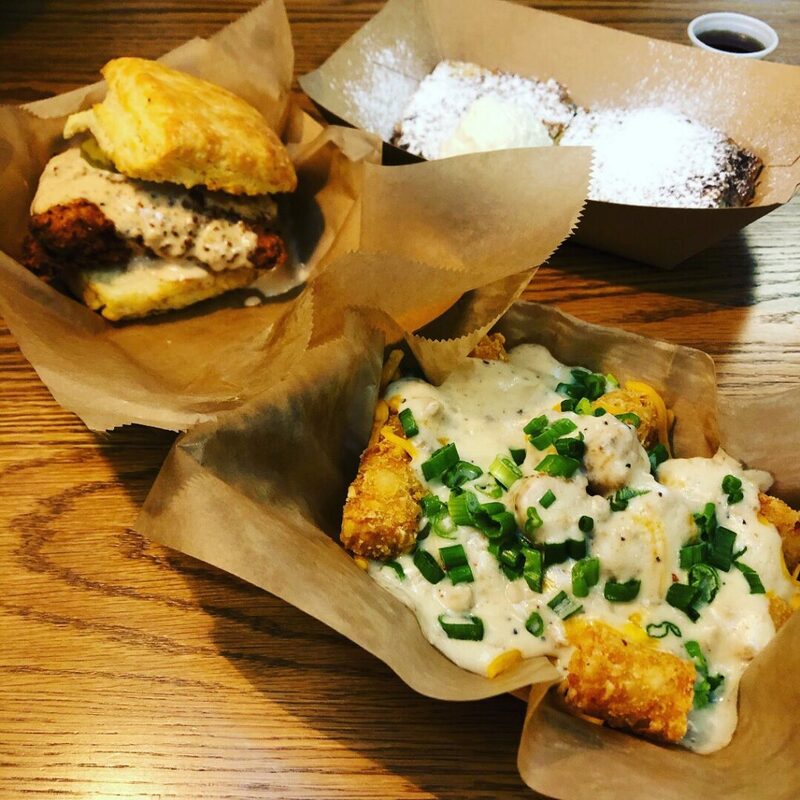 Apart from its magnificent biscuit creations, The Biscuit Bar is also known for its tater tots. 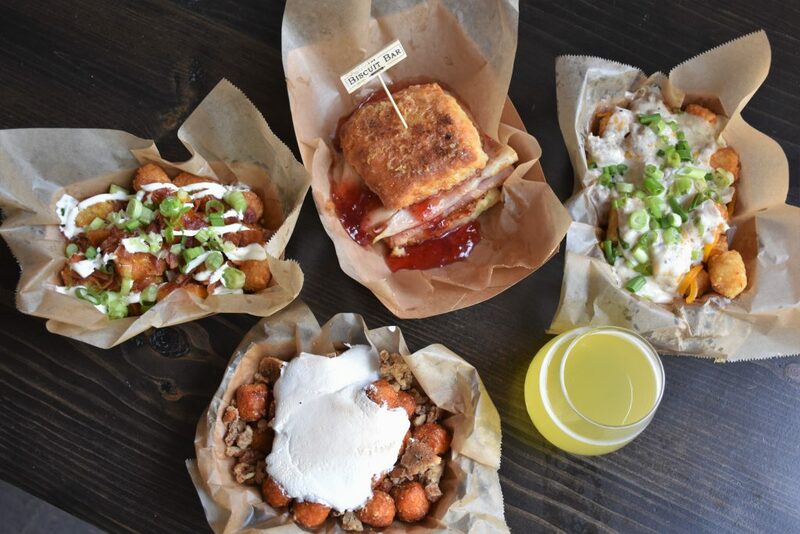 The tater tots can be ordered in different types of styles, including Holiday Style, with brown sugar, pecan streusel and toasted marshmallow. Tots can also be ordered Southern Style, with housemade sausage gravy, green onions, and cheddar cheese. While the inside of The Biscuit Bar can get crowded pretty quickly, sitting outside on Granite Park’s boardwalk on a crisp, spring morning makes sitting down and eating brunch all the more enjoyable. Although The Biscuit Bar serves its full menu on a daily basis, brunch at The Biscuit Bar is best when enjoyed among friends on a carefree Saturday morning. Alex Gonzalez is a writer at Local Profile. He is a lover of food, music, sports, art, and world cultures. Alex was born and raised in Plano and graduated from University of North Texas in 2017. When he is not writing, Alex enjoys hiking, attempting to cook, going out to happy hours, and playing board games with friends.